The next time you are flying somewhere, do not bury your nose in a book or plug in your earphones. Take a good look around. And if you happen to be sitting next to Vembu Vaidyanathan, a wiry, fast-talking man with a thick moustache, do not forget to ask for some tips on how to strike up a life-changing conversation. Vaidyanathan, or Vaidy to his friends, has had two of those conversations in airplanes in the past two years. In April 2010, he met Kishore Biyani on a flight to Hyderabad. The retail tycoon made Vaidyanathan a dream offer - a 10 per cent stake to come in and run Future Capital Holdings (FCH), his troubled non-banking finance company (NBFC). It took Biyani three months to persuade Vaidy to step away from ICICI Prudential, where he had spent barely a year as managing director and CEO in the C-suite shakeout that took place after K.V. Kamath handed over leadership at ICICI Bank to Chanda Kochhar. At 42, Vaidy already had a decade at Citibank and a decade at ICICI under his belt and was considered a star among India's bankers; he had won particular praise for building ICICI's retail, rural and SME businesses and he was the youngest member on ICICI's board. Vaidy said he would have never joined Biyani for a salary. "I was already in a top job at ICICI," he told Business Today during a series of conversations. He was stepping into a bomb crater. Biyani had launched FCH in 2007 with Sameer Sain, an old friend and Goldman Sachs banker. But then the global financial crisis struck in 2008, the markets were in turmoil, and Biyani's plans to combine FCH with his retail empire, offering credit at high interest rates, just would not work. Sain wanted to build FCH's investment banking and private-equity capabilities. The two men had an acrimonious parting. "We went through two crises," Biyani said enigmatically. "A lot of plans got changed. We wanted to work on the credit business at that time, but some of us did not want to take that risk." After he took over, Vaidyanathan went about assembling a top-notch management team. Apul Nayyar, who runs FCH's retail financial services, had India Infoline, DSP Merrill Lynch and Citigroup in his pedigree. Shailesh Shirali, who heads FCH's wholesale business, came from DSP Merrill Lynch and before that Rabo India Finance and ICICI. On August 10, 2010, when Vaidyanathan took over as Vice Chairman and Managing Director, the Future Capital Holdings stock was trading at Rs 291.20. On its first day of trading, February 1, 2008, FCH closed at Rs 908.20. Its IPO price was Rs 765. The following Monday it closed at Rs 1,030.05 and its market capitalisation stood at Rs 6,513 crore. It seemed unstoppable, but it never made that level again. FCH's market cap had plunged to Rs 1,871 crore when Vaidyanathan took charge. Ten months later, FCH was on an even keel. Its loan book was starting to move from an over-dependence on the wholesale business. Retail loans rose from 19 per cent in 2009/10 to 42 per cent in 2011/12. Mortgage loans account now for close to 80 per cent of its retail portfolio. But Biyani, whose Future Group was groaning under total debt of about Rs 8,000 crore, had decided to shed his non-core businesses - and Future Capital was a rich lode waiting to be mined. Vaidyanathan began to look around for a buyer. Which brings us to March 7 this year, when Vaidyanathan was on an evening flight from Delhi to Mumbai. "It had been a tiring day and I was slumped in my seat," he said. "I found myself next to somebody and we got chatting." His fellow passenger was Narendra Ostawal, a principal with Warburg Pincus. "After we landed we got in touch with each other and things started moving." On June 4, Biyani's Pantaloon Retail India Ltd announced that Warburg Pincus, the respected US private-equity firm, would acquire a controlling stake in Future Capital, whose market value at that point was Rs 1,050 crore. Warburg is taking 40 per cent at Rs 162 a share, or a total of Rs 420 crore, and will make an open offer for a further 26 per cent at Rs 273 crore. Any shortfall will be sold to Warburg by Pantaloon Retail. In the third stage, the company will issue Rs 100 crore of fresh capital to Warburg in the form of Compulsorily Convertible Debenture shares. Future Capital's market capitalisation had dropped to Rs 991.42 crore on June 14, when its shares closed at Rs 153. Warburg Pincus announced that Vaidyanathan would stay on as head of the company. Company officials said Vaidyanathan would become the chairman; he is currently Vice Chairman and Managing Director. His personal stake stood at nine per cent after dilutions - worth about Rs 95 crore. It was a dream come true. "I wake up at four in the morning and think about how wonderful things worked out," Vaidyanathan said. His research on the Internet showed he had just figured in India's largest management buyout of a listed finance company. "The concept of a professional taking a stake in a company at its early stage and building it from there is a fantastic route for an upcoming professional. Things are still unfolding and a few years from now will tell the full story." Vaidyanathan said. Kishore Biyani said in the beginning Future Capital planned to do a lot of its business through his retail outlets. "There were a lot of ideas actually," Biyani said. "There were a lot of South American retailers especially in Brazil and Mexico who virtually run banks. Credit can fuel consumption. It was a lot of things in the making, a lot of opportunities came up, a lot of other things happened." Biyani says he is pleased with the Warburg deal. "I think it is in good hands. Vaidy is a great person. He is very involved." 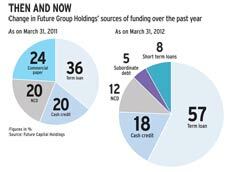 Future Capital's sale was another instalment in Biyani's headlong rush to slash his group debt. Just over five weeks earlier, Biyani had sold a controlling stake in his flagship Pantaloons stores to Aditya Birla Nuvo Ltd. Warburg Pincus, who are currently invested in 17 Indian companies including Diligent Power, Gangavaram Port, Havells, Kotak Mahindra, Moser Baer and Punj Lloyd Group, pride themselves on being long - view partners. FCH today is a far cry from 2010 when Vaidyanathan took over. Its loan book rose to Rs 46,704 crore at March 31 this year from Rs 28,548 crore a year earlier. Operating profit rose to Rs 1,741 crore in 2011/12 from Rs 964 crore a year earlier. Return on equity rose to 13.41 per cent from 6.66 per cent. "Given the expertise in the (finance) sector that Warburg had, we were in a position to move very quickly. We already understood the space, understood what Vaidy was trying to build, and so we moved forward with a great degree of conviction," said Vishal Mahadevia, Managing Director at Warburg Pincus India Pvt Ltd. Despite the current difficulties in India's economy, Mahadevia said Warburg looked at broader opportunities. "Credit growth will continue to be there for a long period of time. Secondly the market for financial services is still highly under-penetrated in India, particularly for retail and SME financing." All this, plus a strong regulator, plays into why Warburg invested in Future Capital. "It's all about the team, the system, the infrastructure, the platform that has been built. Vaidy has really spent the past two years or so building that platform. In our mind he is really somebody who has tremendous experience in this retail and MSME lending space, from his days at Citi to ICICI to Future Capital. So we are really backing Vaidy and his team. Now it's really up to him to take this forward." Warburg is a "patient investor" with a strategic position on the board, but day-to-day management is left to the current team.